In 2010 veteran broadcaster Lisa Bowes was rinkside at Vancouver’s Canada Hockey Place when Marie-Philip Poulin scored twice to lead the Canadians to their third consecutive Olympic gold medal. Eight years later, Bowes is encouraging children, especially young girls, to stay active and pursue their dreams of perhaps following in the footsteps of Poulin and other hockey heroines. Her latest book “Lucy Tries Hockey” is the fourth installment in the Lucy Tries Sports series. The publication features the introduction of a young red-headed girl named Lucy to Canada’s national winter sport. In previous installments, Lucy has tried soccer, luge and short-track speedskating. “Our mission is that Lucy will inspire children to try sport, be active and therefore lead healthier and happier lives,” Bowes said in an email interview. Bowes cites a June 2018 project by ParticipACTION that gave Canadian kids a near-failing grade of D+ for overall physical activity. She has made it her passion to help to reverse declining physical activity rates. “My hope is that a child will ask: ‘Can we go out and kick the soccer ball like Lucy?’ It doesn’t always have to be about registering for a season, or a clinic, but to just be active,” Bowes said. “I feel truly blessed for Wickenheiser’s support and we’ll be donating books to Wickfest this year in Calgary and Surrey,” Bowes said. Throughout the entire Lucy Tries Sports series, Bowes has promoted High Five Canada’s principles for healthy child development: play, participate, make a friend, master a skill, and have a caring adult coach. By adopting these guidelines, Bowes believes that children will continue to stay in the sport(s) of their choice. Bowes also stresses that the philosophies are non-gender specific. “Both girls and boys relate to Lucy because she’s a kid just like them. If children can see it, they can be it!” she said. 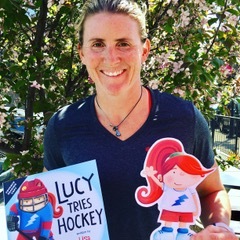 “Lucy Tries Hockey” and all other three books in the series are perfect bedtime reads for parents of children of all ages, whether their highest aspiration is scoring goals in the Olympics like Poulin and Wickenheiser, or simply being able to kick the ball, shoot the puck, or skate like Lucy. “Lucy Tries Hockey” by Lisa Bowes is now available from Orca Publishing.